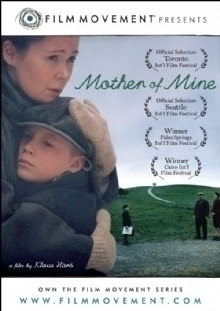 Finland’s official submission for the Best Foreign Film category of the Academy Awards finds critically acclaimed and award winning documentarian and filmmaker Klaus Haro tackling his dream subject matter concering the emotional and devastating true terrain of the more than 70,000 Finnish children evacuated to neutral Sweden, Denmark and Norway to avoid conflict during World War II. For Mother of Mine, now thankfully released in America thanks to the wonderful cinema lovers at Film Movement, Haro set his fictitious story in 1943 as we meet Eero (an excellent and mature Topi Majaniemi) whose father dies in the front lines of the war, causing his mother to make the harrowing decision to send him to Sweden until their homeland calms down. Once in Sweden, he’s taken in by a farm family who were hoping for a daughter and we witness Eero's difficult time adjusting to the abrupt and curt Swedish mother Signe (Maria Lundqvist), whom audiences quickly realize is dealing with the aftermath of a tragedy of her own. Like Zhang Yimou’s The Road Home, the film is book-ended by black and white clips showing the characters living in present day society and cutting back in time to the vivid, breathtaking color of the past with heightened sound (thanks to the exquisite DVD transfer that plays even better on larger screen televisions with stellar surround sound) and astute, intimate and quietly minimal portrayals by the leads. The 2005 film was an official selection at over thirteen film festivals around the world and earned three Jussi Awards (the equivalent of Finland’s Oscars), a Best Foreign Language Film Satellite Award and the Audience Award from the Palm Springs International Film Festival.